The establishment report of +114,000 jobs was pretty much about what most expected. 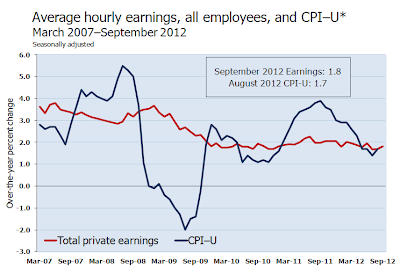 The four-month average is a mere 120,000 a month (a very weak set of establishment numbers for this point in a recovery). 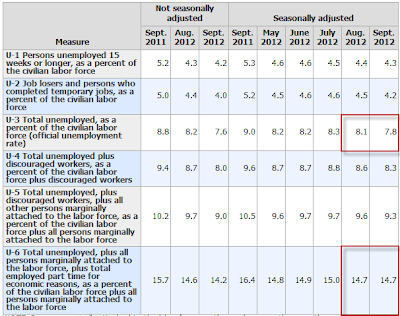 However, the household survey surprise shows the unemployment rate fell three-tenths of a percent to 7.8%. 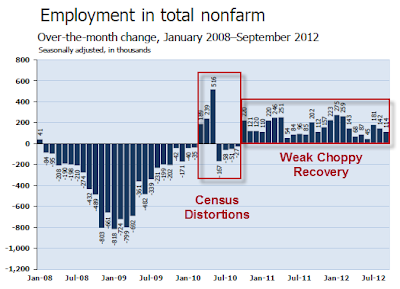 On the surface, this is a solid showing, and 100% certain to boost the Obama campaign. 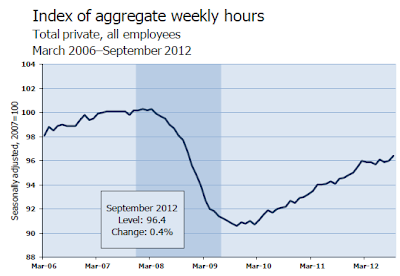 I suggest these numbers will overshadow a horrendously weak performance by the president in the debate. That said, a closer look shows the entire drop in the unemployment rate can be attributed to a surprise rise of 582,000 in part-time workers. 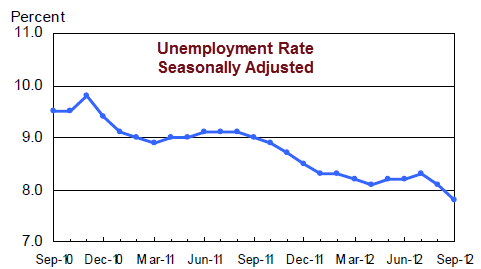 U-6 unemployment remained at 14.7%. U-6 includes part-time workers who want a full-time job. Still, all things considered, this was the strongest report in four months. Does it change my recession outlook? No, it doesn't. 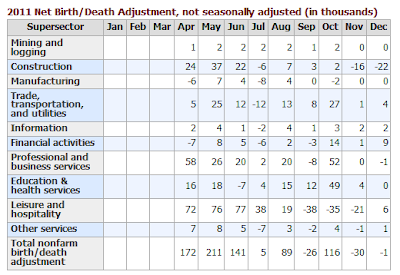 A one-month potential outlier based primarily on a rise in part-time employment, accompanied by other weak data does not change my perception. Here is an overview of today's release. U-6 unemployment did not drop. It remained at 14.7%. 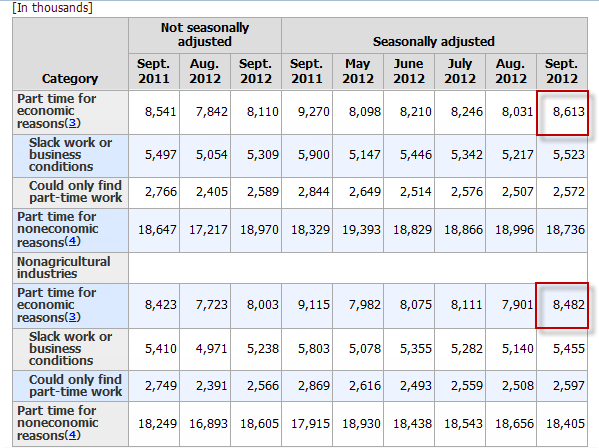 Over the course of the last year, the number of people employed rose by 2,867,000. 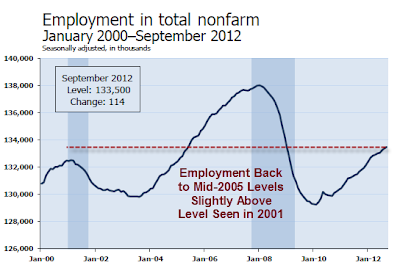 Were it not for people dropping out of the labor force, the unemployment rate would be well over 10%. 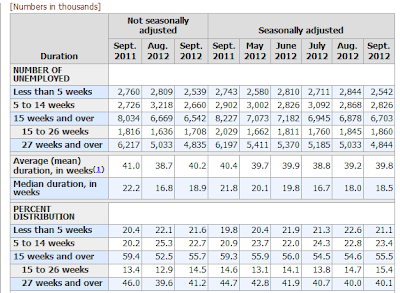 Please consider the Bureau of Labor Statistics (BLS) September 2012 Employment Report. Employment is above the total just prior to the 2001 recession, and about where it was in 2005. 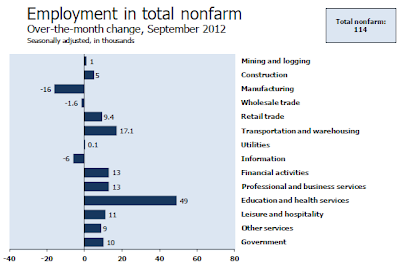 Statistically, 125,000+- jobs a month is enough to keep the unemployment rate flat. For a discussion, please see Question on Jobs: How Many Does It Take to Keep Up With Demographics? Since the beginning of the year, job growth has averaged 145,000 per month, compared with an average monthly gain of 175,000 in 2011. Note the historically rare occurrence this month of a negative non-January adjustment. In the last year, the civilian population rose by 3,701,000. 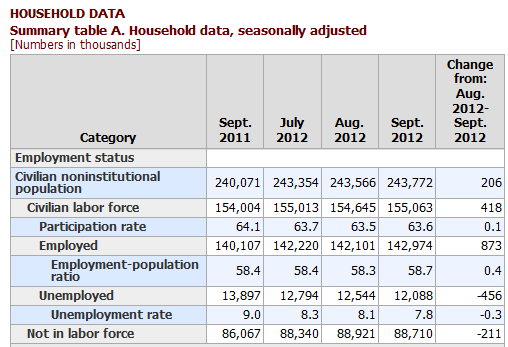 Yet the labor force only rose by 1,059,000. 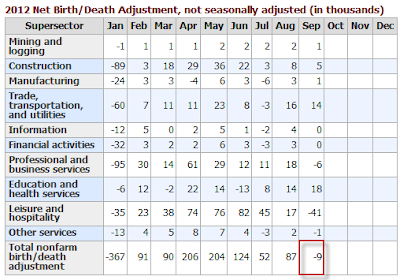 Those not in the labor force rose by 2,643,000 to yet another record high 88,921,000. That is an amazing "achievement" to say the least, and as noted above most of this is due to economic weakness not census changes. 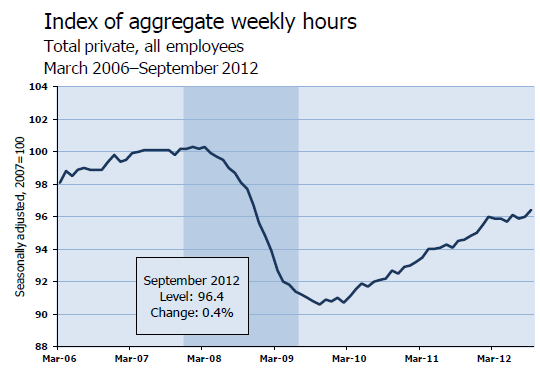 There are 8,613,000 workers who are working part-time but want full-time work. This is a volatile series, however, this month's jump of 582,000 is exceptionally large. 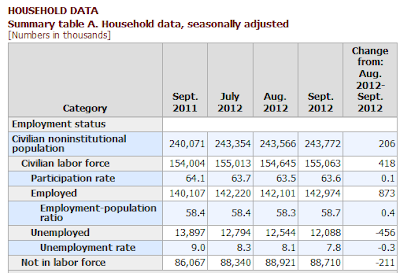 The official unemployment rate is 7.8%. 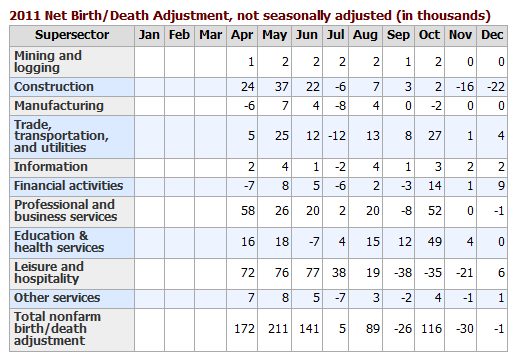 However, if you start counting all the people that want a job but gave up, all the people with part-time jobs that want a full-time job, all the people who dropped off the unemployment rolls because their unemployment benefits ran out, etc., you get a closer picture of what the unemployment rate is. That number is in the last row labeled U-6. 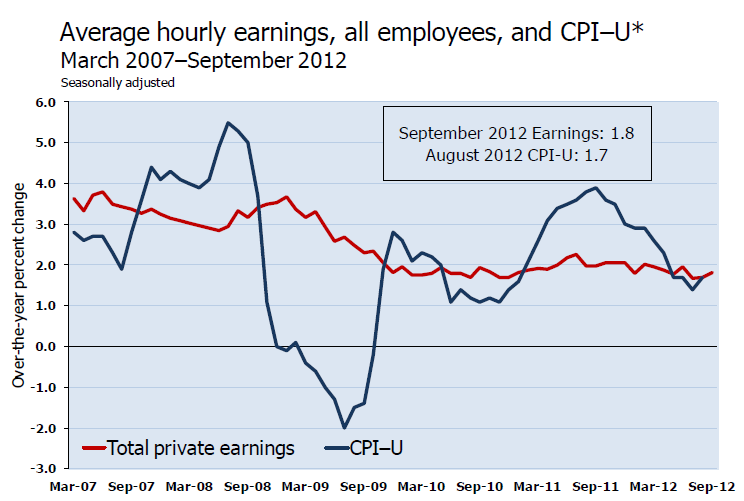 U-6 is much higher at 14.7%. Both numbers would be way higher still, were it not for millions dropping out of the labor force over the past few years. 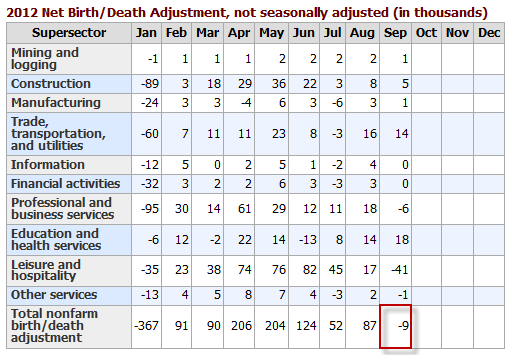 Note that U-6 unemployment did not drop. 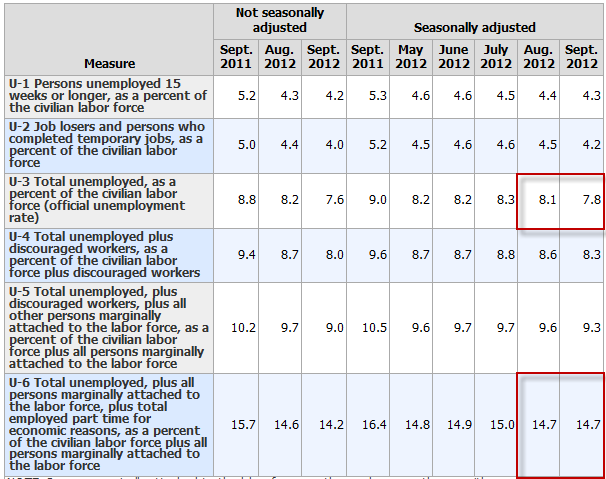 Only baseline unemployment did. 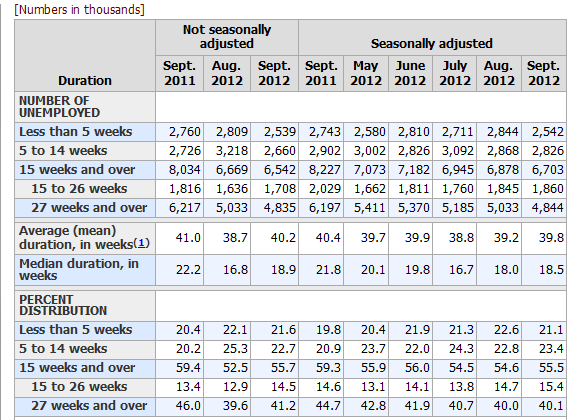 Long-term unemployment remains in a disaster zone with 40% of the unemployed in the 27 weeks or longer category. Given the complete distortions of reality with respect to not counting people who allegedly dropped out of the work force, it is easy to misrepresent the headline numbers. Digging under the surface, the drop in the unemployment rate over the past two years is nothing but a statistical mirage. Things are much worse than the reported numbers indicate.